Other (optional): I was born September 21st 1971 in Adelaide, South Australia. Married to Karina in 1993, I am fortunate that she shares my interest in motorcycling and travel. Our motto is ‘an experience shared is an experience doubled’. Positions Held at Chapter, State/ Provincial, International Level: Previous National Association of Australia Vice President, Previous Australian Ambassador. 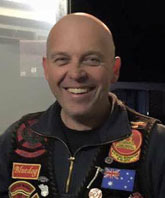 Other (optional): In 2011 I saw a flyer looking for expressions of interest in the Red Knights International Firefighters Motorcycle Club, joining Australia 6 as a Charter Member. Without doubt this was one of the best decisions that I have ever made. As a member of Australia 6 I have attended a number of Annual Conventions being Gettysburg 2012, Prince Edward Island 2014, San Antonio 2015 and Wisconsin in 2016. Other (optional): Leaving school I studied Automotive Mechanics before enlisting in the Royal Australian Air Force as an Aviation Fire Fighter in 1997. During my time as an automotive mechanic I started my interest in firefighting, joining a volunteer organisation called ‘Women for Wheels’ a dedicated Motor Sport Fire & Rescue Squad. I have attended many different forms of motorsport, from drag racing, speedway, oval track, circuit racing and the pinnacle Formula One. In my 19th year as a career firefighter I have seen many changes from organizational to appliances. Changes within Defence saw me change from enlisted to contractor in 2006 remaining on an Air Force Base in Victoria. Whilst in the Air Force I received an Officers Commendation along with the DUX of course for both my basic and advance firefighting courses. Primary reason(s) for running: Provide leadership in a high growth Region along with increasing communication from our members in our Region to the International Board. Develop and increase mutual assistance between Australia and New Zealand all the while developing stronger ties with our great Nations. Identifying and utilizing the incredible talent that this club has to offer to continue growth in our Region. Vision for future of RKIMC: By bringing both a fresh face and ideas to the International Board, by embracing both our traditions but also moving into the future to increase our membership base and encourage the younger members of the Fire Fraternity to join and provide mentoring to enable the Club to continue for many years to come. Establish a Regional Quarter Master to reduce costs to Region 8 members for International Regalia. Encourage Chapters in Region 8 to share, participate and develop a Regional Association that supports and provides guidance to our members.